Ji'an is a medium-sized metropolitan area in Jiangxi Province, China. Far East Mobility's work on TOD is carried out in cooperation with BRT Planning International, LLC. As noted in part 1, Ji’an does not have its own Planning and Zoning Guidelines and as such, it follows the Jiangxi Province City Planning and Zoning Guidelines, currently from 2014. What follows is an international review of the various options for good zoning practice around transit stations, with a special focus on whether and how each practice is applied in China and Ji’an in particular. From there, a more detailed look on how better practice could be applied in Ji’an will be taken. This article focuses on issues of station area zoning and mixed land use. Transit station areas have special characteristics that often warrant the creation of a special zoning district or at least special zoning provisions that apply to properties adjacent to or near a rapid transit station. Such overlay districts are the most common way of dealing with special local conditions where standard planning and zoning regulations are insufficient. Special zoning districts are typical for historical areas, waterfronts, major commercial streets, downtowns, and transit station areas. Proximity to a mass transit station sometimes requires special treatment. On the most basic level, sometimes zoning requires properties on top of or adjacent to a mass transit station to provide an ‘easement’ allowing access to the transit system from the adjacent properties. In the case of underground metro systems, it is quite common for the metro system to need the buildings above the system to allow some portion of the property to be used for access to the stations. Often, zoning bonuses (e.g., additional building height or mass) are awarded to property owners that provide direct access between their building and the station. Transit districts tend to allow for higher density, a greater mixing of land use, lower parking requirements (if any), better pedestrian and bike facilities, and a higher density of streets and pathways. Beyond this, the buildings within a short walk of a mass transit station enjoy privileged access to an expensive public facility that makes it possible for their residents to live comfortably without needing a private car to meet their daily travel needs. As such, far more people can live and work in close proximity to each other, as the amount of space needed to get people in and out of the area by mass transit is far lower than it would be by private car. As such, transit districts tend to allow for higher density, a greater mixing of land use, lower parking requirements (if any), better pedestrian and bike facilities, and a higher density of streets and pathways. Most commonly these are not shown on the zoning map; there is simply language in the regulations that state that any property within a specified distance of a mass transit station is designated as a transit station area and special zoning provisions therefore apply. In some cases these overlay districts are focused on 300 – 550 meters around the station, in other cases they cover the entire mass transit corridor. An example of a special transit corridor zoning designation that is shown on a zoning map and anchored by a BRT system is shown for Cleveland, Ohio, USA below. Special transit corridor zoning designation, Cleveland BRT corridor. Cleveland has a relatively liberal zoning system which allows for mixed use in the following way: Land uses are ranked from heavy (heavy industry being the ‘heaviest’) to ‘light’ (residential being the ‘lightest’). Any lighter land use can be built in an area zoned for a ‘heavier’ use, so in an area zoned for ‘heavy industrial’ a developer can if they so choose put in light industrial, offices, retail, or even residential if they so choose, though most developers would not put a residential building in an industrial area. An area zoned for retail can also have offices and residences, but an area zoned for residential can only have residential. In the case of the Cleveland BRT, the Midtown District Urban Development corridor (MMUD) (the central section of the BRT corridor) was previously zoned industrial so the underlying zoning did not need to change. However, the city wanted to make sure that new developments in the new BRT corridor were oriented to using the BRT system. As such, they created three transit zoning classifications: MMUD – 1, MMUD – 2, and MMUD – 3. These designations set minimum height restrictions (as opposed to maximums), required that 80% of the lot be covered by the building, cut the parking minimums by 50% and turned the former minimums into maximums, required all street frontage to include retail, and buildings had to be built to the ‘red line’ or the edge of the property line without a setback. The result was that a formerly economically distressed industrial neighborhood was transformed into one of the most popular and economically successful areas of the city, leveraging over $6 billion in new real estate investment in one of the poorest cities in the United States. When new buildings are built adjacent to a transit station, it is also best if the designs of these buildings are fully integrated with the planned transit station. New York City’s zoning regulations, for instance, require that any new building constructed in a designated Transit Station Area zone needs to be fully integrated with the transit station and the designs must be approved by the Metropolitan Transit Authority; the agency responsible for managing public transportation in New York City. In the Arlington, Virginia, USA zoning regulation shown below, three mixed use categories have been created: Medium-density Mixed Use, High Medium Residential Mixed use, and Coordinated Mixed Use Development District. In addition, a zoning classification was created that included offices, apartments, and hotels in one category that varies by density and height. The land immediately adjacent to the Metro station has been rezoned mostly as either one of the mixed-use categories, or the offices, apartments, and hotels category. Primary intensification areas within 1,000 feet (305m) and secondary intensification areas within 1,600 feet (488m) of mass transit stations are shown in blue and red circles. In China, the national government is currently encouraging the creation of special transit area planning districts and several Chinese cities have already done so. Section 11.1.1 of the Guidelines for the Planning and Design of Urban Pedestrian and Bicycle Transportation Systems issued by the Ministry of Housing and Urban/Rural Development (MOHURD) in 2013 requires that the roadway and intersection designs within 600 metres of a transit station be optimized for pedestrian and bicycle access to the station. Section 5.6.2 of the Guidelines for the Planning of Urban Parking Facilities (MOHURD, 2015) states that parking facilities in transit station areas should be reduced and parking maximums should be applied in transit station areas and city centers. Many municipalities have further elaborated on this new national guidance. Hong Kong, Shenzhen, and Shanghai have the most extensive special provisions for station areas, while several other cities also have special provisions for station areas. These provisions will be discussed at greater length below. Mass transit station area zoning approaches in Chinese cities. Performance-based zoning, which sets out the objective of the zoning in the code and leaves it up to developers to comply with this objective. Planning officials must determine whether or not the developer has complied on a case-by-case basis. Performance-based zoning is perhaps ideal from the perspective of achieving a desired social objective, but it requires the greatest level of sophistication among both developers and government regulators. As such, it remains relatively rare and limited to one or two social objectives, such as minimum hours of sunlight access per window. One of the foundations of early Euclidean zoning was the separation of land uses. This principle emerged in the early 20th century primarily as a way of separating industrial land uses from other urban functions so that urban residents would not end up living or working next to a noisy and polluting factory. Since then, most cities have realized that some land uses are compatible with one another and others are incompatible. There is almost never any difficulty mixing commercial and office functions, for instance. Mixing residential with specific commercial functions can work very well, but not so well with others. Apartment dwellers are generally quite happy to have their ground floor occupied by coffee shops and convenience stores, but less content with nightclubs and bars which might make noise until late in the night. The mixing of compatible land uses is a cornerstone of TOD as it minimizes travel distances and activates the street. One of the principles of the TOD Standard is “Mix”. The TOD Standard weights each of eight principles based on how important they are to encouraging people to use public transit and “Mix” is worth 25 out of 100 points, making it by far the most important principle. With mixed land use, opportunities and services are within a short walking distance of where people live and work, and the public space is activated over extended hours. Liuyun Xiaoqu, a 1980s-era development in Guangzhou originally built as single-use residential, provides an excellent model of retrofitting mixed uses, with shops and other ground floor services making the area more attractive and successful and supporting employment and economic growth. Distribution of mixed uses in the Liuyun Xiaoqu neighbourhood in Guangzhou. Before the early 2000s, the area was single-use residential. Dead streetscape with single-use residential or office towers in Ji'an. One of the city's greatest assets is its walkability and appeal to pedestrians, but in newer areas of Ji'an where single-use zoning is being applied, the streetscape is far less active. Creation of new ‘mixed use’ zoning classifications, or allowing for the mixing of two or more compatible land uses in a single category. One way in which mixed-use happens in China is that two or more categories that are deemed compatible are allowed to mix in a single development, with the overall development still having a single use zoning based on the primary use. Tiered land use regulation where zoning categories that allow land uses with significant externalities also allow all land uses with fewer externalities. Japan applies a system of tiered land use zoning based on ligher and heavier impacts of certain activities which is similar to the approach used in Cleveland. Japan defines twelve categories of Land Use Zone which can be generally categorized into residential, commercial and industrial uses. Each Land Use Zone has specifications concerning the uses of buildings which can be constructed in the zone. For example, in a commercial zone, all land uses are allowed except for factories with a possibility of danger or environmental degradation. Thus all kinds of shops, houses, services, warehouses, hospitals, unversities, temples and other land uses are permitted in a commercial zone. In the most exclusive case of "category 1 exclusively low-rise residential zone", only three types of land use are allowed: (i) Houses, Houses with other small scale function (store, office, etc. ); (ii) Kindergartens, Schools (Elementary, Junior High, Senior High); and (iii) Shrines, Temples, Churches, and Clinics. It is noteworthy that even in this most exclusive land use category, mixed use is always permitted in the form of the non-residential land uses listed above. This land use mixing built into the Japanese nationally applied zoning code. The tiered land use zoning in Japan is controlled at the national level, and even the most restrictive category still allows substantial mixed use. 'Small scale function stores, offices, etc' are allowed in every land use category in Japan except for in 'exclusively industrial zones'. Shrines, temples, churches and clinics are allowed in every land use category. Source, and more information on zoning in Japan. Some cities maintain rigid single use zoning classifications but manage to allow mixed use anyway by having the border between a commercial and residential zone pass through the middle of a building or property, so that the two land uses can be right next to one another. This is another way that mixed-use happens in China, and is especially important in Ji’an, where planning officials are resistant to allowing significant mixing within a single zoning category. Many cities, including major cities in China, either supplement or override single-use zoning within special zones. This sort of zoning overlay might designate mixed use only within such an overlay district, or it might simply require that planned developments submit their plans to a special administrative body which then uses their professional discretion to determine compliance. Some cities have no zoning at all, though they have some regulations governing developers. Houston, Texas is one such city. Zoning classifications in the West are highly detailed. There are sometimes dozens of use categories, and usually additional categories for specific ‘user groups’. These detailed codes make it easier to avoid the sort of externalities that the single use zoning was intending to avoid, while typically permitting a mix of compatible uses. For instance, special commercial zoning categories for bars, clubs, and adult-oriented commercial activities are far more restrictive and limited in scope than zoning that allows offices and small scale retail. Below is the zoning map for Madison Avenue in Midtown Manhattan, New York City. Fine-grained single use zoning with multiple sub-categories: Example from New York City Midtown. The center of the area is zoned C5-2, which allows for an FAR of 10, with a 20% increase if there is a public plaza and another 20% increase if there is a public facility. It also allows for residential development following zoning code R-10. The lots with a letter after them, such as C6-4A or C6-2A, etc. are contextual commercial districts. This designation was first introduced with the zoning reforms of 1986. These districts are substantially residential in character, but are zoned as commercial in order to allow commercial development. The provision includes detailed tables of which sorts of land uses are compatible with each other. Table of compatible land uses, Shanghai. The Standards and Guidelines for the Urban Planning of Shenzhen (深圳市城市规划标准与准则 - updated in February 2017) includes similar provisions. Provision 2.2.1.3 has modifications of the designations for land use that are contained in the national Code for Classification of Urban Land Use and Planning Standards of Development Land (城市用地分类与规划建设用地标准 - GB 50137 – 2011). For example, the Shenzhen classifications provide an additional 'R4' residential classification covering mixed use urban villages built by original area residents, and the business & commercial categories are greatly simplified compared to the national code. Warehouse & logistics categories are also simplified, and the Shenzhen code includes an 'S9' covering refueling facilities that is not included in the national code. However, for the key measures influencing TOD, the modifications to the land use categories in Shenzhen do not appear to be the essential enabling factors. Put another way, the national land use code does not present a barrier to to implementation of mixed use or mass transit station area zones. Designations applied to station area development zoning in Shenzhen such as S3 (literally mentioning 'rail', but relating to major transit hubs which could be considered as including major BRT stations) and S4 (relating to transit facilities more generally) are provided in the national code which is applied in Ji'an, and mixed use is envisaged under the national code, as explained below. In areas designated as city centres and important commercial areas and public service areas in Shenzhen, two types of land use are encouraged to be mixed: R2 and C1, or highrise residential and commercial & business uses. Along rail mass transit lines (land use code S3), Shenzhen specifically encourages the mixing of S3 + R2 and S3 + C1 (highrise residential and commercial), and allows the mixing of S3 with dormitory style residential and sports facilities (GIC2 and R3). Mixes of land uses encouraged and allowed in Shenzhen. Standards and Guidelines for the Urban Planning of Shenzhen, Section 2.2.3.4, emphasis added. Potential mass transit categories are S3 and S4. Highrise residential (R2) is encouraged to be mixed with commercial (C1). Industrial areas can also be used for commercial uses (offices, retail, hotel, etc). In other Chinese cities including Ji'an, even where there is no direct encouragement of mixed use, either the zoning map is sufficiently detailed that single buildings have multiple zoning designations, allowing for the mixing of commercial and residential or office and commercial in the same building, or the zoning designation can still allow uses which are not the same as the primary use, especially complementary uses. The national code applicable in Ji'an lists the complementary uses allowed for some categories. Municipalities in Jiangxi Province, including Ji’an, use a Euclidean zoning system based on broad categories of land use set out in the national code GB 50137 – 2011: residential, commercial, industrial, public service facility, etc. A few cities in China such as Shanghai and Shenzhen, as described above, provide a different set of categories, but they remain broadly consistent with the national code. Mixed use development in the same land is encouraged. Ji'an, like other cities in China, does not have a zoning classification for ‘mixed use’, but the national code applicable in Ji'an anticipates and does not disallow mixed land uses, and the provincial zoning code encourages mixed use. The national code stipulates that single developments with multiple different uses should be classified for the zoning purposes according to their main use. (Shenzhen's code is more explicit in actually encouraging or allowing such mixing of land uses.) Therefore, there seems to be flexibility and opportunity at the city level to provide greater detail to supplement the national code on land uses and to encourage or at least allow more mixed land uses. Mixed land uses could be encouraged or allowed either for all highrise apartments areas in the city (as is the case in Shenzhen), or at least in BRT station areas, drawing from the S3 and S4 land use categories related to mass transit stations. "2.1.2. The usage and location of development projects should follow the principle of compatibility. [...] Mixed use development in the same land is encouraged. The ratios and development scale for each usage shall be defined in regulatory & detailed planning, and shall be included as a condition of a plan." Section 2.1.2 of the Jiangxi guidelines also stipulate that, "The compatibility rules of development land shall be defined in regulatory & detailed planning", and Ji'an planning officials are currently working on this planning. The new zoning map of Ji’an has a sufficiently fine grain in specific locations to allow for mixed-use development within a single block. However, there are relatively few such areas in the planned BRT corridor. Such zoning is most prominent in the southern part of the city on both the western and eastern sides, a block or two set back from the riverfront. Note however that both the national and provincial codes envisage implementation of mixed use developments which are compatible with a single use zone. For example in a commercial zone, provided the main character of the development is commercial, a development could include residential apartments, retail, business offices and a parking garage and still be classified as 'commercial'. "The land classification of this standard is divided and classified according to the main nature of the actual use of land. Land with multiple uses shall be classified on the basis of the nature of the facilities used for its main use. Considering for example a high-rise multi-functional integrated building where the ground floor has shops, floors 2-15 are business offices, floors 16-20 are apartments and the basement is a parking garage, the property is mainly business office, so it is classified as "commercial facilities land" (B2). If the main nature of the use of the complex is difficult to ascertain, categorize according to the primary nature of the underlying use." Source: Code for Classification of Urban Land Use and Planning Standards of Development Land (城市用地分类与规划建设用地标准 - GB 50137 – 2011), Section 3.1.1. Ji'an Zoning Map 2016 - 2030 shows blocks where the land use category is divided within the block. Red is retail commercial, orange is commercial offices, purple is public services and government offices, and yellow is residential. The current zoning applied in the station areas of the planned BRT system is shown below. In the Ji’an city centre, the zoning around the planned BRT stations (below) is largely for single use by block, with large blocks of commercial or residential land uses. A few blocks are broken up by some schools (in purple), and a few have both residential and retail on the same block. The Ji'an planning authorities in interviews with Far East Mobility say they apply a restrictive approach in which a maximum of only around 7% of a development may be used for uses which do not match the primary zoning classification. Allowing a higher proportion of mixed uses in developments along the BRT corridor or around BRT stations may therefore be something that could be solved simply by the Ji'an authorities applying a less restrictive approach to allowing land uses outside the primary classification, say up to 50% or more of a development instead of the current informally applied 7%. Current zoning, stations areas, Ji'an central area. The centre of the proposed BRT stations are shown by red markers. Existing land uses, Ji'an central area. When this land use plan for 2030 (from 2016) is compared to the current land use (shown above), it shows that the current regulatory direction is towards reducing rather than increasing the level of mixing of compatible land uses in the urban core. Several blocks with existing mixed land uses (retail on the main BRT corridor and residential behind it) have been rezoned for single use, either all commercial or all residential. While this area is already built up, in China it is not uncommon for land use to change rapidly, particularly along a BRT or metro corridor. As such, without a special ‘transit area’ approach to allowing a higher proportion of uses outside the primary designation, it is possible that many of the existing mixed use developments in the Ji’an central business district will be replaced with single use buildings to comply with the current zoning regulation. Moving south, the next major area of Ji’an is Guan Di Shang, the area being newly developed around the municipal offices. Much of this area is currently still under construction. The zoning is almost entirely for large blocks of single use zoning: three superblocks of residential followed by several superblocks of commercial. As this area is currently rapidly being developed, a transit station area overlay or planning bureau approach not only allowing but encouraging greater land use mixing (while retaining compabitility with the zoning code) could make a big difference to how this area develops, though it is probably already too late for some of the developments. Current zoning, Guan Di Shang, the new city government administrative area in Ji’an. The southern terminus of the BRT corridor travels through another open area being land-filled that is currently rapidly developing, followed by another largely built up area, Ji'an County. Existing lane use, as of around 2015, in the Ji'an County area. Current zoning, Ji'an County (BRT stations marked in red). As Ji’an does not yet have a rapid transit system, it does not yet apply approaches such as those used in Shenzhen to encourage the mixing of land uses around mass transit stations or corridors, but there does not appear to be anything in the national or provincial codes which would prevent Ji'an from adopting such an approach. If Ji'an issued a regulation stating that a higher proportion of mixed uses would be allowed around the BRT stations, such a regulation would not be in contravention of either the National Code for Classification of Urban Land Use and Planning Standards of Development Land GB 50137 – 2011 or the Jiangxi Provincial City Planning and Zoning Code, which encourages cities to adopt mixed-use developments. With the introduction of BRT in Ji’an, it should therefore be possible to introduce, following the examples of Shanghai, Shenzhen and other cities, approaches which would encourage or at least allow the mixing of commercial, residential, public service, and office land uses within 500 meters of the BRT stations, without any departure from standard practice in China. The new approach encouraging mixed use around BRT stations and along the BRT corridor could be documented as part of the regulatory and detailed planning which the provincial guidelines envisage will be prepared by cities including Ji'an. High density development around mass transit station areas is one of the central tenets of transit-oriented development and the integration of land use and transport. Dense station areas maximize the network efficiency and economic benefits of transit system investments, ensure that station areas are lively and thrive economically, and create a market in passengers for the transit systems. Planning high density land use around stations also creates opportunities for the government to capture some of the value from mass transit. Chen Dun Peng and Xiao Sheng from the Shenzhen Urban Planning & Land Resource Research Center explained in an interview with Far East Mobility on 19 September 2017 that Shenzhen looked to best practices from around the world to guide its standards formulation, and the area of density was one area in which a strong case could be made that all parties - government, private citizens, and developers - can benefit, which makes it easier to implement any new approach. Shenzhen applies a formula to adjust the base density level upward for areas in close proximity to mass transit stations. The basic formula applied is FAR规划＝FAR基准× (1+ A1) ×(1 + A2)…; in which A1, A2, ... An represent adjustment factors for considerations including proximity to metro stations, number of sides which have roads, and the plot size. Increased density allowed within 200m and 500m of metro stations in Shenzhen. Ji'an could adopt a similar approach of allowing higher density development in a range of 200m and 500m of BRT stations. The current density maximum from the Jiangxi Province planning and zoning regulation is only 2.8 FAR for a highrise residential development greater than 50,000m2 floor area, up to 3.5 FAR for a development with less than 10,000m2 floor area. For commercial developments, the maximum allowable FAR ranges from 4.5 to 5.5 depending on the building size. Shenzhen defines six density classes. The highest two classes allow for a maximum FAR of 6 for residential developments, and the highest class provides for a maximum FAR of 15 for commercial developments in the city centre. Maximum FAR allowed under the Jiangxi provincial zoning regulations in force in Ji'an. 'R' is residential and 'B' is commercial. The top row is the floor area of the development, and the left column refers to a range of building heights (in metres or floors). The percentage refers to the building coverage of the site area. The explanatory report accompanying the Standards and Guidelines for the Urban Planning of Shenzhen also cite the cases of Hong Kong and Ningbo. In Hong Kong, the highest FAR category applying to buildings with a height of 61m or higher in proximity to major metro stations is 10, with a permitted plot coverage of 40%. (The maximum plot coverage of 40% is the same as the maximum in the Jiangxi regulations). Ningbo also adjusts the maximum FAR according to proximity to metro stations, using the same categories as Shenzhen: less than 200m from a station, and 200m-500m from a station. Like Shenzhen and Hong Kong, Ningbo takes plot size into account, with higher FAR allowed for smaller plot sizes. The maximum FAR in Ningbo for sites within 200m of metro stations is 9 for commercial use, and 4 for residential use. Maximum allowed FAR around mass transit stations, for commercial and residential land use. Finally, it can be noted that Shenzhen's approach to encouraging mixed use developments in proximity to mass transit facilities is reflected in the calculations of maximum allowable density. For mixed use developments, the adjustment factors for the baseline FAR take into account the proportion of the development that is allocated to each of the different uses, noting that the allowable commercial FAR is higher than the maximum residential FAR. The Jiangxi Province zoning and planning guidelines enable the individual cities to develop implementing guidelines, and these guidelines can be used by Ji'an to bring the city into line with international and national best practices in TOD in the key areas of mixed use and density. For implementation of mixed use, neither the national nor provincial guidelines present an obstacle to Ji'an allowing and encouraging a mixing of compatible land uses in BRT station areas. Allowing higher maximum density in BRT station areas than is currently stipulated in the provincial guidelines could be approached based on the special circumstances provisions of the provincial guideline. For density, mixed use and other TOD aspects, Ji'an should codify proximity to BRT stations as a factor influencing the planning approaches defined in the detailed implementing regulations which are currently being prepared pursuant to the provincial guidelines. The next part of this series on TOD in Ji'an will consider best practice and recommended approaches to pedestrian facilities and building setbacks, and will summarize the proposed TOD measures and improvements in Ji'an. 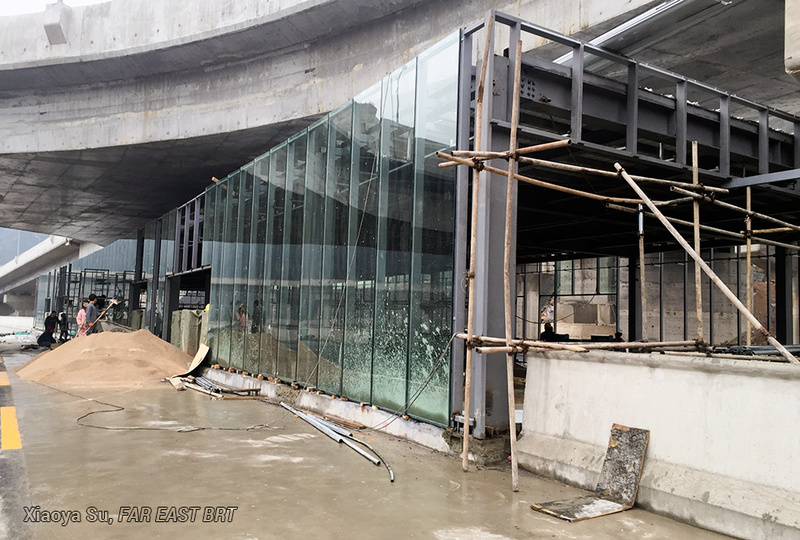 Continue to part 3 on Ji'an TOD, covering parking, street network, pedestrian realm and setbacks. Later articles related to TOD in Ji'an will document proposed parking improvements, including an on-street parking management zone in the central area, proposed pedestrian facility improvements in the central area, and a detailed case study of the outstanding Ru Lin Li mixed use development. The ongoing BRT project will also be featured when the key design features are finalized.